Kolkata: India Runway week Season 9 recently commenced at DLF Place Saket, New Delhi. Every season India Runway Week introduces designers from all across India and this time too for its 9th edition it has designers from Indore, Mumbai, New Delhi, Ahmedabad, Chennai, Kolkata, Hyderabad, and Punjab. We have some very young and creative minds from Jaipur who showcased this season like Gazal Mishra and Apash by Aparna and Shruti. 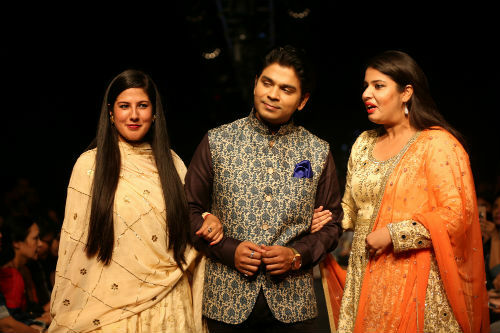 The day 2 of India Runway Week W/F 2017 was opened by amazingly talented designer from Jaipur Apash by Aparna and Shruti where Singer Ankit Tiwari mesmerized everyone by his voice while walking the ramp for the designer duo. APASH is brand coming from the land of culture and heritage. This is what the brand came up with theme Kesariya which clearly described the heritage and royalty of the state Rajasthan. The round is going to have lot of colours on the ramp with beautiful handcrafted work of Gota- Patti, Pitten and Zardozi. Kesariya theme has showed showing modern women yet very traditional and rooted from their own roots with amazing shades of Kesariya that is saffron colors. There surely a lot of drama on the ramp. Beauty queen Lopamudra Raut spread her charm at IRW W/F 2017 for Gazal Mishra. GAZAL MISHRA- The collection by Gazal Mishra for India Runway Week Winter Festive 2017 was full of life, colours and grace. A lot of colours were used still kept the designs subtle.